A NASA space probe, sent to collect samples of life in our solar system, crashes on re-entry and causes a large-scale alien contamination between the American-Mexican border to as far south as San Pedro, Mexico. To contain the creatures, the United States and Mexican governments quarantine the area. Monsters 2010 takes place six years after the crash, when the large squid-like behemoths have become part of the altered reality. It opens when freelance photographer Andrew Kaulder (Scoot McNairy) is asked to check up on his publisher's daughter, Samantha Wynden (Whitney Able), who is injured in the partial collapse of a building in San Jose, Costa Rica. The collapse was apparently caused by one of the creatures, which had migrated much further south than the infected area. Kaulder is asked to give up his assignment to ensure Wynden is safely returned to the United States. The couple board a train, en route to a town bordering the infected zone in Mexico, with the intent to take a ferry to the United States. Except, Wynden won't make the last ferry after Kaulder's one-night stand leaves in the morning with both passports, leaving them both with a forbidding prospect. They can pay a smuggling operation to take them through the infected zone by land. 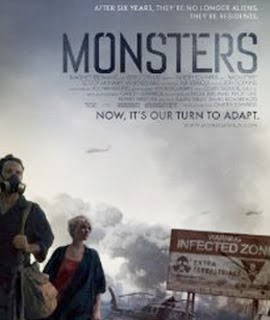 Monsters Is A Surprisingly Realistic Expose On Human Adaptability. Writer-director Gareth Edwards had an exceptionally unique vision for his film, Monsters. The realism and rawness can be attributed to Edwards' effects work, ranging from Perfect Disaster, a 2006 television documentary series on disasters like super tornadoes, to the Space Race, a television documentary series on rockets in 2005. As his screenwriting and directorial debut, Edwards proves he has a breathtaking vision for a human drama with the monsters being served up more as a metaphor than a premise. While this will leave some previewers (and moviegoers in October) who are expecting Cloverfield or District 9 disappointed, Monsters will find a fan base if it can reach the right people. Who are the right people? If you transpose the cause of an alien infection with any number of manmade or environmental catastrophes (drug cartels, immigration, terrorism, oil spills, hurricanes, super tornado zones, etc. ), the movie depicts how people are surprisingly adaptable in being able to live in the shadow of fear and occasional drama. Even in areas where the creatures can strike without warning, people stay put for lack of a better plan. This film also provides human insight into how two people, one with no prospects and one with an undesirable prospect, might find each other within the frames of a slow burn thriller rather than roller coaster action. It is this approach that makes the movie more memorable as the pair are passed from one group of questionable guides to another. Monsters Makes A Mark With 8.7 On The Liquid Hip Richter Scale..
On iTunes, the pre-theatrical release is struggling for a solid rating but not for the Monsters as much as the price. The rental rate is $9.99 ($10.99 for HD). That is a hard sale price on a platform where most rentals are $3.99 and movie sales are between $9.99 and $14.99. However, having worked on the marketing side of independent films, I suspect Edwards is using iTunes prices to fund to a wider release because there is no money to distribute the film. Almost everyone worked on the film for free, with a production budget of a mere $15,000. While Edwards proved you can make a high quality film for $15,000, you cannot distribute one for that much (not unless someone helps you). You can check out the documentary here. Edwards is the kind of film maker you want to help. And McNairy and Able are two actors you'll want to see more of in the near future. We only hope Edwards doesn't diminish theatrical sales too much with the pre-release or make people second guess purchasing the film once it officially makes it to DVD and digital. If the small screen gets behind the film, it could be the indie dream that Purple Flowers failed to realize two years ago. We hope Edwards wins. It's much better than Paranormal Activity and without the gimmick of a first-person film.